Last week, WIPO, the African Union, the governments of Japan and the Republic of Senegal, hosted the African Ministerial Conference 2015 in Dakar. The theme of the conference was IP for an Emerging Africa #AfricaInnovates. The focus was on the continent as a producer of innovation, rather than a consumer of innovation. Made by Africa for Africans (particularly in the creative industries.) Other issues include sustainability and focusing on opportunities in the knowledge-based economy. The conference covered a wide variety topics (see for yourself here). Broadcasting - Ownership of television in Africa is increasing very quickly. As a relatively undeveloped sector in Africa, TV holds a lot of economic potential at the same time it has important cultural, social and political impacts. The impact of digital is on the horizon although challenges such as ‘signal piracy’ and ‘pirate subscribers’ are more immediate problems. Simultaneously streaming online is, like many things in the digital era, both an opportunity for increased revenues and a threat for competition from consumption of unlicensed content. Favourite pithy soundbite: Netflix is coming to Africa, will video kill the radio star? Collecting societies – Create or be Created! In a discussion on collecting societies, the question was: “Did you create today or did you import?” Again a focus on Africa as a source of innovation. Collective management organisations (CMO) were discussed, previous post here, as necessary to the smooth running of the copyright system. Nadia Vally, Deputy Director, Copyright and Enforcement Directorate, from the UK IPO, presented on the UK’s experience on CMO’s transparency, accountability and governance as key ingredients to maximising the returns to rights holders. All very sensible. Governments throughout the continent are in various stages of developing their CMOs (previous post here) and looking to learn from more established systems. 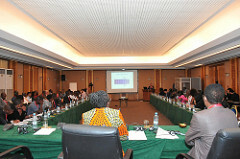 Young Innovators - The conference also held events, awards and discussions for young African innovators. The nominees, or as I like to call them, people-who-make-you-feel-like-you're-impossibly-lazy, have done amazing things like create this art and become a Ugandan billionaire at the age of 23. IP discussions are inherently global, and many of the themes of the conference were reassuringly, or perhaps worryingly, universal. For copyright, creators are concerned with IP awareness and enforcement. Access to finance for innovation, particularly in the creative industries, is a common challenge. To embrace #AfricaInnovates, the continent faces unique challenges, in addition to challenges found internationally, in encouraging domestic innovation. Inter-governmental conferences at this level (there were a number of Ministers and a PM -- that’s how I roll) are no easy undertaking. Couple a few hundred attendees with two official languages, delegations flying in from all over and the delicate diplomatic dancing required to balance diverging interests, and you’ve got an organisational challenge. And that’s before we even start with security details and gluten-free diets. 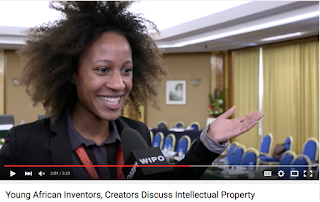 I’m not sure how the good people at WIPO and partner organisations do it, but they did. They should also be commended for working towards gender, linguistic and geographical balance. My reading suggests IP policy in Africa is concentrating on capacity building and IP education to promote awareness. This awareness can be important for both individual innovators and creators, and society in recognising and developing innovation. It may be tempting to focus purely on enforcement, legal or compliance issues, but policy facilitating innovation and creativity is never a bad thing.